Money Machine Rental St. Louis, MO. Mobile money booth.Money Machine Rental St. Louis, MO. Mobile money booth. Searching for a money machine rental St. Louis? Money machines are great fun at a party. Your guests will delight in watching their friends get in and wildly grab at the bills! Although the bills are swirling all around you, it’s harder than it looks to grab them! The money machine was a big hit at our employee appreciation event! Our team members were quite riveted as one after another went in to grab their bonus money. We call it money machine rental St. Louis. No matter what you call it, money machines are great fun! Cash cubes are a great way to attract prospects at a trade show and build excitement. For retail promotions–for instance at car dealerships or shoe stores–money grab machines bring in customers and create a lot of excitement in your store. At Christmas parties and employee appreciation events, cash cages are a novel and fun way to reward employees and celebrate your success. At Monte Carlo nights, mobile money machines are a great activity for players to get extra play bills in a fun way! 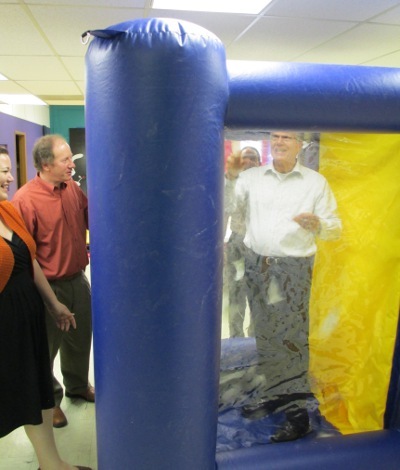 Your inflatable cash cube added a fun touch to our open house. People enjoyed the chance to win coupons, while bystanders got a kick out of all the wild clutching going on inside. I think the money machine helped us draw a good crowd. Choose whichever service level you prefer. 1) Full Service. 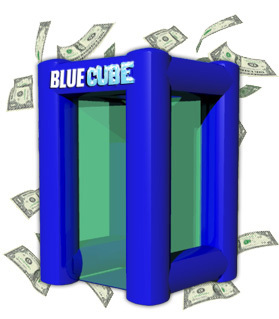 We can deliver, setup, staff, break down, and take away the inflatable cashcube so you don’t have to worry about anything. 2) Partial Service. We deliver, set up, break down, and take away the money machine. You run it. Or 3) Self Service. You arrange a money machine rental from us and handle delivery, setup, breakdown, and return yourself. Here is a short video on how to set up and tear down the money machine. We can also show you how when you come by if you’d like. Where do we do our money machine rental St. Louis? Primarily in and around the St. Louis area, both in Missouri and Illinois. So whether you are in Ellisville or Edwardsville, Richmond Heights or Fairview Heights, O’Fallon MO or O’Fallon IL, we’ve got you covered! Periodically we rent money machines in neighboring states—Tennessee or Kentucky, Iowa or Indiana, Arkansas or Oklahoma. In these cases, to make the drive worthwhile, we often will provide other entertainment as well, such as magic, our game show, etc. To arrange your money machine, call Abra-Kid-Abra at 314-961-6912 or 888-963-ABRA (2272). Or email us.